Find out how to support the UC San Diego Medical Center Bannister Family House and receive a discount on local Bartell hotels. 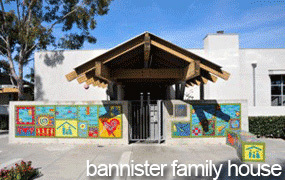 The UC San Diego Medical Center Bannister Family House provides affordable lodging and supportive services for families of patients undergoing long-term care at UCSD Medical Centers. Bartell Hotels and the Bannister Family House have formed a cause-related partnership. If you book one of these Bartell Hotels, you will receive a 15% discount below the best available rate and Bartell will donate 10% of the total room cost back to Bannister Family House. Go to the Bartell Hotels/UCSD Medical Center site. Select one of the hotel logos on the left side of the page. Click on the booking link or call the hotel's toll-free reservations number. When booking, mention that you're with the UC San Diego Medical Center Bannister House. In addition to each hotel's own reservations contact number, general reservations inquiries may be directed to (800) 345-9995. For large groups or events, contact Dana Irby at (619) 224-1556. Contact Denise M. Capozzi, (619) 543-7977.